The perfect weekend recovery food! 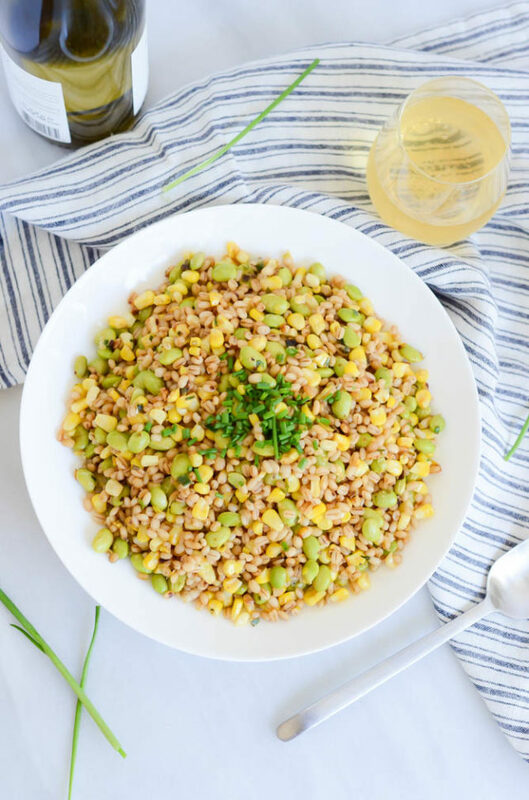 This Fresh Corn, Leek and Edamame Grain Salad is a perfect, healthy, filling meal if I ever saw one, and it’s oh so delicious. If any of you had a weekend like I had, you’re definitely ready to whip this up with your favorite lean protein for dinner tonight. As I mentioned on Friday, we were up in Santa Cruz visiting my parents this weekend, which also happened to involve helping my little sis move into her new house and having an early Sunday birthday brunch for me. All of the family affairs, celebrations and craziness never make for the healthiest eating, but I never restrict myself (everything in moderation!) and just make sure to eat extra-healthy in the days leading up to and following all of the madness. That’s what balanced living is all about! So when we rolled back into town late last night, all I wanted was a big bowl of whole grains and veggies. 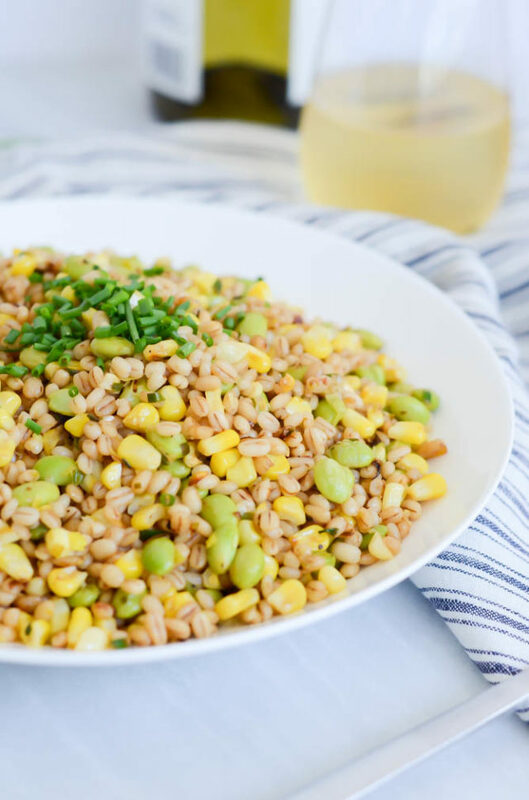 Unfortunately, I didn’t have any of this Fresh Corn, Leek and Edamame Grain Salad sitting around in the fridge, so we had to settle with takeout. Not necessarily the healthiest of options (although we still try to get a well-balanced meal even when we order out) but we knew we’d get right back in the groove of healthy eating today. Smoothies for breakfast, salads for lunch. You get the idea! This should last all of two days since my birthday is on Wednesday, but we only live once, right? 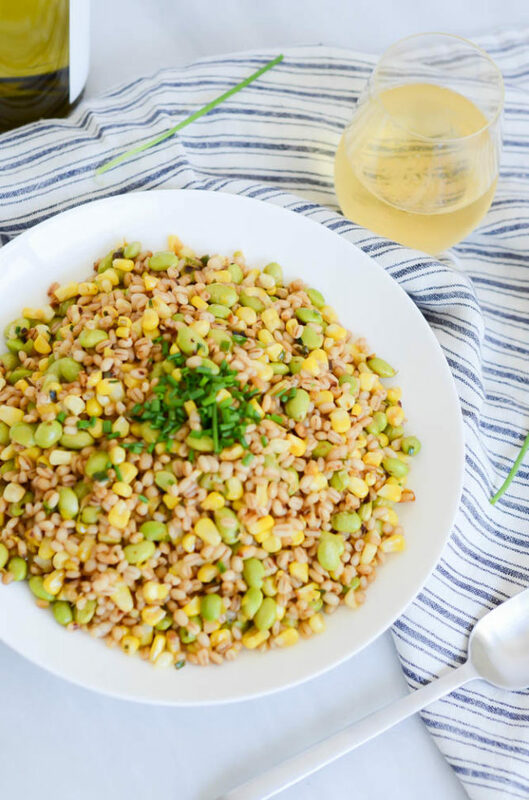 It’s no secret that ever since I tried the most delicious grain salad in Napa, I have been obsessed with the idea of them. It was way back in May of last year that I made this Herbed Grain Salad with Broccoli Rabe and White Beans, so I figured now that we’re having some warmer “salad-friendly” weather here in California, it was high time for me to come up with another fun version featuring some of spring’s freshest produce. 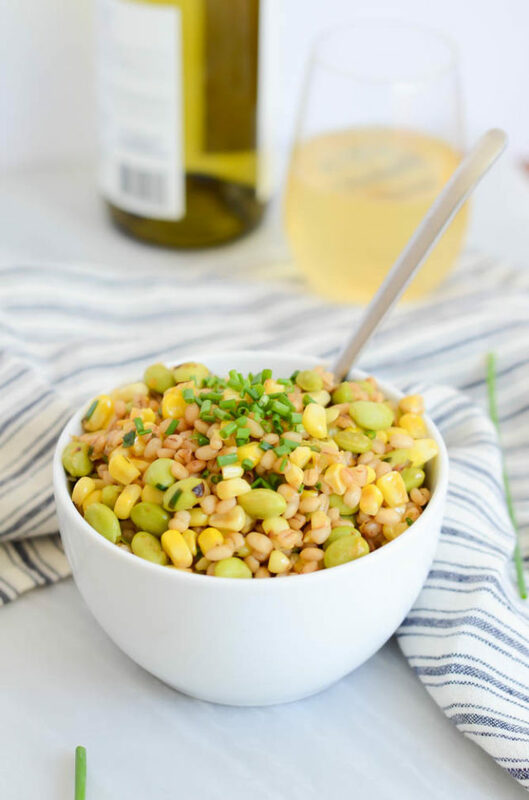 I’m very happy to say that this Fresh Corn, Leek and Edamame Grain Salad is not going to let you down and, even better, if you don’t love butter as much as I do, you can easily make this dish vegan! So let’s get down to the dirty details. First of all, if you live anywhere near a Trader Joe’s, you’re already in great shape. I got all of my ingredients for this salad there, except for the lemons because we have an abundance of them growing in our yard at the moment. That being said, you really shouldn’t have any trouble getting these ingredients at just-your-average grocery store, TJ’s just makes it soooo convenient. I started out by sautéing some fresh leeks and garlic in a healthy dose of butter. It may seem like a lot at first, but keep in mind that we’re adding much more to this dish than just leeks and garlic, and all of those extra ingredients mean we need all of that extra butter. BUT, if you are trying to be uber-healthy or if you follow a vegan diet, you can swap in good ol’ coconut oil and this salad will still turn out amazing. Promise. After our leeks and garlic have started sweating it out a bit, we add some fresh corn kernels. If you don’t happen to live in an area where you can get fresh corn year round, frozen kernels would also work just fine. The corn kernels are followed by our cooked, shelled edamame, which Trader Joe’s conveniently sells prepped and ready to go in their produce section. Again, if you don’t have access to these, a frozen bag of shelled edamame would work just fine. Just be sure they’re already cooked! The final steps are to throw in some pre-cooked barley (a great thing to meal prep on the weekends and throw into healthy meals all week) and some snipped fresh chives. The only sort of dressing that graces our salad is the aforementioned butter and a hefty dose of fresh lemon juice. I do want to mention one thing about the ¼ cup quantity I’ve called for here: we have Meyer lemons in our backyard, which tend to be more sweet and less tart than your average lemons. That being said, if you are using standard lemons, you may want to dial it back just a tad. Just remember to taste as you go and balance the acidity out with the salt. You’ll do just fine! 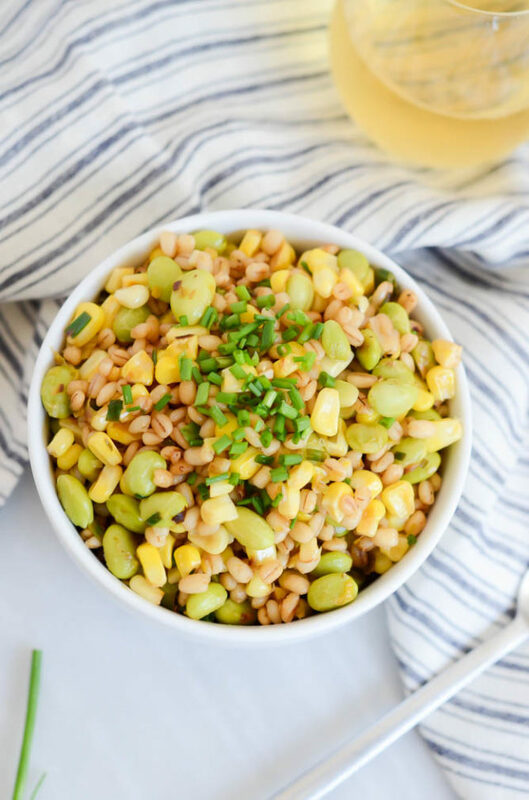 This Fresh Corn, Leek and Edamame Grain Salad is full of filling carbohydrates (which I know some of you colder-weather readers are still totally craving right now) yet plenty of fresh, vibrant produce to remind us that spring is just around the corner. It comes together in under 20 minutes and tastes just as good hot or cold, making it perfect to have on hand for any situation that requires a healthy meal ASAP. It’s quickly become another go-to of mine and I hope it will soon become one of yours too! 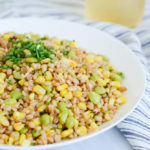 This hearty and healthy grain salad is the perfect dish to usher in warmer weather - loaded with filling carbohydrates and vibrant produce, enjoy it alone or with your favorite lean protein! Melt butter or coconut oil in a deep saute pan over medium heat. Add leeks and garlic and saute for about 3 minutes, until leeks begin to sweat and become fragrant. Add corn kernels and turn heat up to medium-high. Turn heat back down to medium and add barley and chives. Stir to combine. Add lemon juice, salt and pepper (tasting as you go) until you’ve achieved your desired level of balanced flavors. Serve warm or cold.